There are two types of custom annotations depending on the type of the chart that uses them - CartesianCustomAnnotation and PolarCustomAnnotation. Below are described all properties that affect the custom annotations. Content: Gets or sets the content of the annotation. 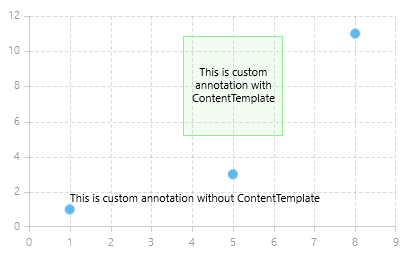 ContentTemplate: Defines the DataTemplate used to display the content of the annotation. HorizontalAlignment: Specifies where the content of the annotation will be rendered horizontally relative to the position associated with the annotation. VerticalAlignment: Specifies where the content of the annotation will be rendered vertically relative to the position associated with the annotation. HorizontalOffset: Specifies the horizontal pixel offset that is applied after the annotation is positioned on the plot (based on its Horizontal or Polar/Radial values). >This property is NOT applicable when the HorizontalAlignment property is set to Stretch. VerticalOffset: Specifies the vertical pixel offset that is applied after the annotation is positioned on the plot (based on its Vertical or Polar/Radial values). >This property is NOT applicable when the VerticalAlignment property is set to Stretch. HorizontalAxis: Specifies the horizontal axis instance that will be used by the HorizontalValue property. By default the annotation takes the default HorizontalAxis defined by the chart. VerticalAxis: Specifies the vertical axis instance that will be used by the VerticalValue property. By default the annotation takes the default VerticalAxis defined by the chart. HorizontalValue: Specifies the place on the associated horizontal axis where the annotation is positioned. >When the axis is numerical (Linear or Logarithmic) a numeric value is expected, and when it is a CategoricalAxis - a category is expected. VerticalValue: Specifies the place on the associated vertical axis where the annotation is positioned. >When the axis is numerical (Linear or Logarithmic) a numeric value is expected, and when it is a CategoricalAxis - a category is expected. 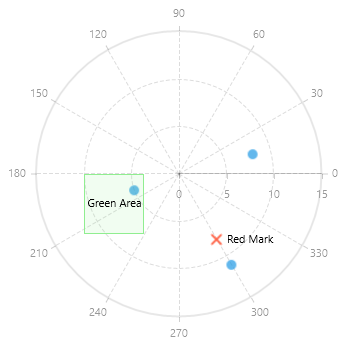 PolarValue: Specifies the place on the polar axis where the annotation is positioned. RadialValue: Specifies the place on the radial axis where the annotation is positioned. >When the radial axis is a NumericalRadialAxis a numeric value is expected, and when it is a CategoricalRadialAxis - a category is expected. This example demonstrates how to add CartesianCustomAnnotation with and without ContentTemplate to a RadCartesianChart. <TextBlock Text="This is custom annotation with ContentTemplate"
This example demonstrates how to add PolarCustomAnnotation with and without ContentTemplate to a RadPolarChart.